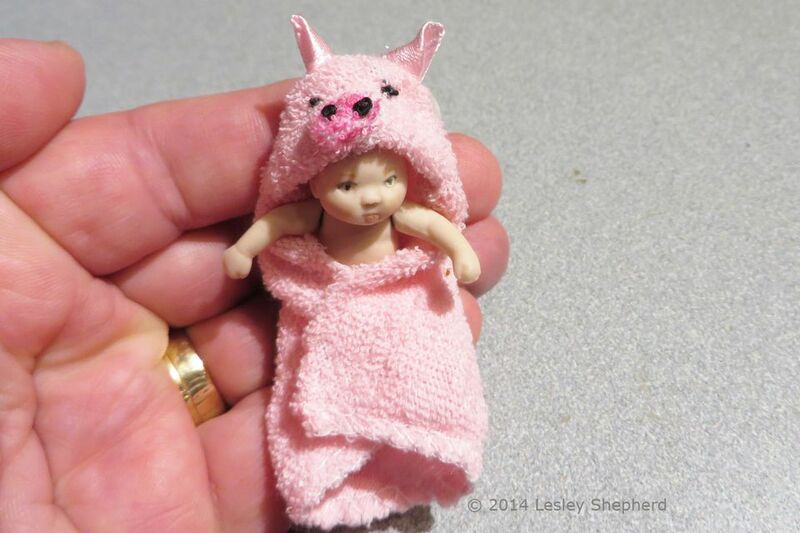 This hooded piglet towel has been made to fit a 1:12 scale dollhouse baby (belly button baby) but you can use this tutorial to make a hooded towel in any size. The fine pink terry cloth I had suited itself to a pig, but you can use the same techniques to make all kinds of other animals on hooded towels. For small scale dolls, the towel is best hand sewn, but you can use a sewing machine for larger versions. There are more instructions for sewing clothing for dolls, including the baby doll shown. See the links at the bottom of this page. Fine scale terry cloth with small loops can be difficult to source for smaller dolls. For my 1:12 scale baby, I chose to use dollar store baby washclothes. I was able to purchase 5 co-ordinated designs for $2. The fabric is very thin, with very short loops, giving it the appearance of terry cloth in miniature. This range of small prints and co-ordinated colors gives me a lot of fabrics for smaller scale doll projects. This terry cloth would be suitable for a wide range of dolls. Larger dolls, like American girl dolls, may suit the type of terry cloth used in baby clothes and full sized towels. To fit a doll for a hooded towel, lay the doll in a corner of your fabric and cut the fabric so it forms a square with the corner just below the doll's legs. As my dollar store baby wash cloth has round corners, I left the corner round for the base of the hooded towel. I will fit the hood into the square end I cut when I cut a section of the cloth to fit the doll. The hood for the hooded towel should be cut as a square. It will be folded into a triangle to reduce hemming. Cut the ssquare so it reaches just below the doll's neck. I cut mine fairly generous so I would have lots of room to add an easily visible animal face to the hood of the 1:12 scale baby's towel. The first step in making the piglet face on the hood of the baby doll's towel, is to cut a small oval of terry cloth roughly 1/8 inch (3mm) larger in diameter than you want the piglet's nose to be. Use sewing thread to run a line of fine running stitches around the outer edge of your oval piece of fabric. Pull the running stitches tightly to gather the edge of the oval, and turn the edge of the fabric to the back of the piglet's nose so the right side of the fabric faces out. (the nose is shown upside down here, I used a darker pink flower from a patterned wash cloth to make my piglet's nose. The nose will be stitched to the right side of the folded square that makes the towel hood when it is time to assemble the piglet face in a few steps. To make the ears for your piglet hooded towel fold a suitably width of ribbon at right angles in two directions as shown and stitch across the base of the fold along the edge of the ribbon on the back. I used 3/8 inch (1cm) ribbon to make the ears for my 1:12 scale piglet hooded towel. When you have stitched the ribbon across the base of the fold (left side of photo on this page), fold the ribbon with the ribbon edges to the center as shown on the right side of the photo to make the pig's ear. The base of the ribbon ear will be trimmed after it is sewn in place to the hooded towel. To assemble the piglet face for a hooded towel, first stitch the nose in place just above where the fold line will be. You want the stitching to be hidden when the towel hood is folded. Make two french knots with black thread for the nostrils in the piglet's nose, and two more french knots for the eyes. Fold the hood section in half so the fold line is across the bottom of the face. Line up the edges of the ear with the edges of the hood as shown, and baste them into position with a running stitch. They will be sewn in place in the seam line when you stitch the hood onto the towel. Baste the second ear in place with the ribbon edge lines in the center of the ear. To stitch the hood to the towel, set the ears so they face into the hood as shown, safely away from the raw edges which will be stitched to the towel. Lay the corner of the towel right side (loopy side) down over the face so the loopy fabric side rests against the piglet face hood. Line up the unfinished edges of the hood with the unfinished corner edges of the towel. Stitch the towel and hood together with a simple back stitch beginning at one corner of the folded hood edge and finishing at the other folded hood edge. Take care not to catch the ears up in your sewing, except where you stitch the hood to the towel across the base of the ears. Tie off your thread and turn your hood right side out, checking your stitching and making sure your ears are free from the seams. When you are sure everything is correct, turn the hood wrong side out again and trim the ribbon at the base of the ears if it protrudes from the seam between the towel and hood. If you are sewing a larger towel for a larger scale doll you can use a sewing machine to stitch the hood to the towel. To finish the raw edges of the hooded piglet towel, roll the edge over to the wrong side and make tiny stitches over the edge to roll the seam and hold it in place against the towel. If you prefer, you can sew a piece of ribbon over the edge to bind it, or add twisted embroidery thread cord to the hemmed edge to finish it. If you are sewing a larger towel for a larger doll, you can finish the edge with a sewing machine.